When it comes to enjoying a day at the beach, nothing can ruin your vacation quite like a shark attack. As a result, if you're planning to travel to one of the United States' beaches, it would be helpful to know which states experience the most shark attacks each year. Fortunately, ichthyologists at the Florida Museum of Natural History track shark attacks on the International Shark Attack File and release annual reports on the places that experience the most of these violent and sometimes fatal encounters. The International Shark Attack File's records include shark attacks that have happened in the United States since 1837 and rank states according to the frequency of attacks. 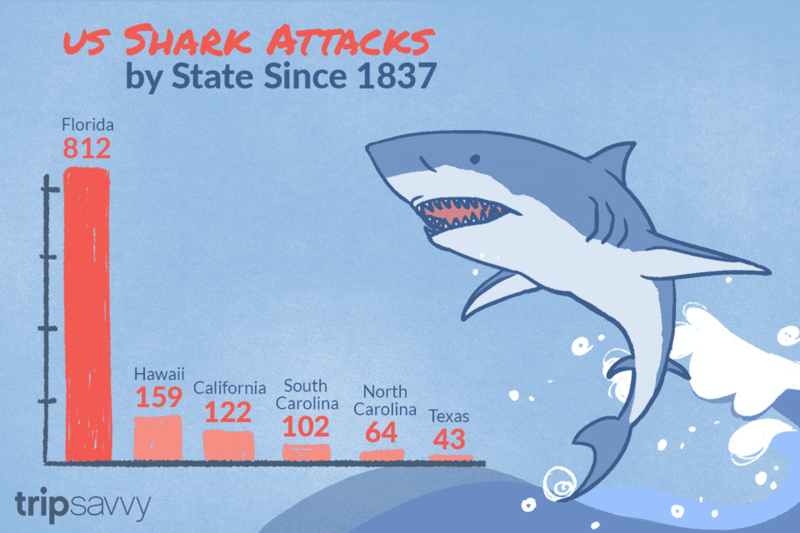 Florida, Hawaii, South Carolina, California, North Carolina, Texas, and Oregon are the states (in order) that have seen the most shark attacks. These numbers are current as recorded on the Shark Attack File as of July 2018. 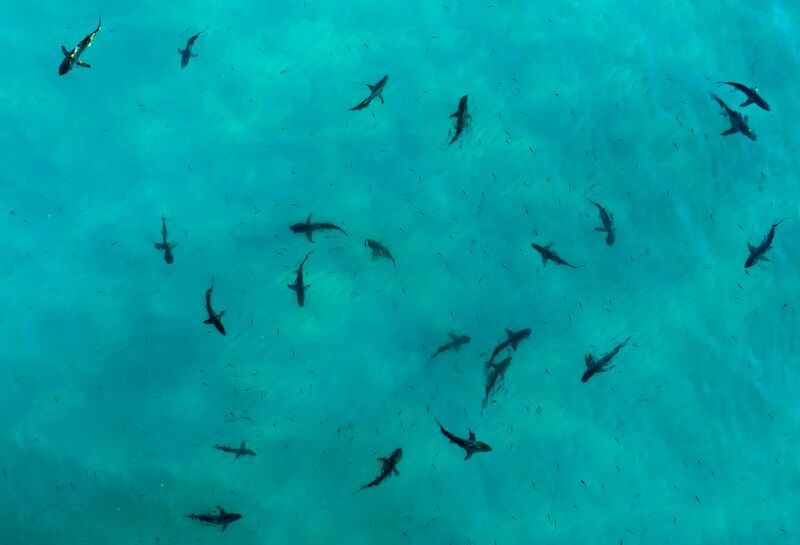 The "endless coastline" of the Sunshine State has seen the most shark attacks since recordkeeping began, totaling more than 800 attacks since 1837, including three fatalities since 2001. Most attacks happen along the Atlantic coast, with Volusia (299) and Brevard (144) counties recording the highest numbers. However, there have also been more than 80 shark attacks in the Gulf of Mexico, primarily off the southern and northwestern coasts. Most shark attacks happen from April through October, with 103 shark attacks reported in September since 1926. Blacktip and bull sharks account for 40 percent of the species involved in unprovoked shark attacks in Florida since 1926 (20 percent each), and spinner and hammerhead sharks account for 16 and 13 percent, respectively. As in Florida, there have been three fatal shark attacks in Hawaii since 2001, but the islands have experienced significantly fewer shark attacks overall with just 159 since 1828. Shark attacks are just as likely off the coast of any of the Hawaiian islands, but because of the population and tourist crowd sizes in Maui, Oahu, and Kauai, these three islands have reported far more attacks than other islands at 62, 48, and 28 attacks respectively. Since the weather in Hawaii remains relatively the same year-round, the frequency of shark attacks doesn't fluctuate much from month to month. However, more incidents have been reported in October through January in the last few years, perhaps because of the warmer temperatures of underwater currents this time of year. Since 2001, there have been five fatal shark attacks, but the number of violent shark encounters is still less than that of Florida or Hawaii, with just 122 attacks reported since 1926. White sharks make up 97 percent of all shark attacks in California. On the other hand, leopard, mako, and blue sharks each make up only 1 percent of the total number of shark attacks—meaning only one attack from each has been recorded since 1950. Since 1926, there have been 102 shark attacks in South Carolina, but only two fatalities have been recorded—both of which happened in the Charleston and Myrtle Beach area. Not coincidentally, Charleston County has experienced the most shark attacks, reporting 34 since 1837, with Horry and Beaufort counties following close behind with 31 and 23 attacks, respectively. Georgetown (8) and Colleton (2) counties have experienced the fewest total shark attacks, mostly because they aren't as popular of destinations for beach-going fun. Since Folly Beach in Charleston County and Myrtle Beach in Horry County are among the most popular ocean-side destinations in the state, these areas have also seen the most shark attacks. The locations with the most attacks have traditionally been in the southern part of the state, with the southern-most counties of Brunswick and New Hanover both experiencing 13 and Onslow and Carteret counties reporting 10 each since 1935. Hyde County, whose beaches border the Pamlico Sound instead of the Atlantic Ocean directly, has only reported three attacks. While the beach might not be the first thing that comes to mind when you think about Texas, the state has hundreds of miles of coastline on the Gulf of Mexico that visitors enjoy each summer. Since reporting started 1911 for the state, Texas has recorded 43 shark attacks resulting in five fatalities—all of which happened before 2001. The Texas locations with the most attacks are Galveston (18) and Nueces (11), which are also the most popular destinations in the state for beach activities. The southernmost county in Texas, Cameron, has reported only seven attacks throughout its history. The last reported shark attack (as of 2018) was in June of 2016 off Pirates Beach in Galveston. Oregon only started reporting incidents of shark attacks in 1974, and since then there have been a total number of 27 shark attacks, none of which was fatal. Since so few attacks have been reported, there's no real data available on which part of the state you're more likely to experience an attack. However, since attacks have steadily increased since 1974, you should still remain cautious no matter what part of the coast you're visiting.